High Quality With A Great Service & Range of Sizes! Width: 90cm, Drop: 160cm, Colour: Cream. Can be cut to size and slats are made from natural wood. Raising the blind. Croft Collection is beautiful and considered. Ecowood Deluxe, Devon Cream Satin - Venetian Blind. Slat Width : 50mm slats. Ladder Tape Colour : Cream. 75cm (approx 2ft 6 ins) wide. Box brackets that can be face or ceiling fixed, so inside or outside the recess. Premium Real Wood 25mm (1") slat Venetian Blinds. Real Wood Venetian Blind. Cords to operate blind up and down on right. 25mm slats. Label states: Made from natural wood; Easy to install; Can be cut down for recess fitting. Premium Real Wood 50mm (2") slat Venetian Blinds. Real Wood Venetian Blind. Dove Grey painted finish. 90cm (approx 3ft) wide. These are premium quality hardwood venetians, with tapes. 50mm slats. Cords to operate blind up and down. 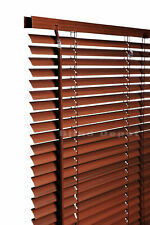 Wooden Venetian Blinds Dark Brown 600mm Wide x 1600mm High x 2. Condition is New. Collection in person only. Premium Real Wood 50mm (2") slat Venetian Blinds. Real Wood Venetian Blind. 60cm (approx 2ft) wide. These are premium quality hardwood venetians, with tapes. Cords to operate blind up and down. 50mm slats. Premium Real Wood 50mm (2") slat Venetian Blinds. Real Wood Venetian Blind. 60cm (approx 2ft) wide. These are premium quality hardwood venetians, with tapes. Charcoal Grey painted finish. 50mm slats. Premium Real Wood 25mm (1") slat Venetian Blinds. Box brackets that can be face or ceiling fixed, so inside or outside the recess. Real Wood Venetian Blind. 90cm (approx 3ft) wide. Cords to operate blind up and down on right. Premium Real Wood 50mm (2") slat Venetian Blinds. Real Wood Venetian Blind. 60cm (approx 2ft) wide. These are premium quality hardwood venetians, with tapes. Oak stained finish. 50mm slats. Cords to operate blind up and down. Premium Real Wood 25mm (1") slat Venetian Blinds. Box brackets that can be face or ceiling fixed, so inside or outside the recess. Real Wood Venetian Blind. Dove grey painted finish. 60cm (approx 2ft) wide. Premium Real Wood 50mm (2") slat Venetian Blinds. 75cm (approx 2ft 6in) wide. Real Wood Venetian Blind. These are premium quality hardwood venetians, with tapes. Oak stained finish. 50mm slats. Cords to operate blind up and down. Faux Wood 50mm (2") slat Venetian Blinds. Faux Wood Venetian Blind. 60cm (approx 2ft) wide. Cords to operate blind up and down. 50mm slats. These are premium quality venetians made from PVC to look like real wood. Argos Home Wooden Venetian Blind -white 60cmX160cmMISSING SCREWS!!!! 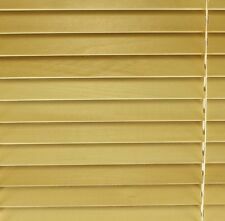 Faux Wood 50mm (2") slat Venetian Blinds. Glacier Grey finish. Faux Wood Venetian Blind. 90cm (approx 3ft) wide. Cords to operate blind up and down. 50mm slats. These are premium quality venetians made from PVC to look like real wood. Faux Wood 50mm (2") slat Venetian Blinds. Faux Wood Venetian Blind. 90cm (approx 3ft) wide. Cords to operate blind up and down. 50mm slats. These are premium quality venetians made from PVC to look like real wood. Premium Real Wood 25mm (1") slat Venetian Blinds. 165cm (approx 5ft 6in) wide. Box brackets that can be face or ceiling fixed, so inside or outside the recess. Real Wood Venetian Blind. Cords to operate blind up and down on right. 50mm white blinds ( Brand New Boxed Never Fitted ) Artic White Wood Affect. 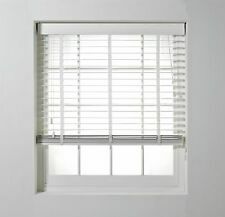 50mm white blinds ( Brand New Boxed Never Fitted ) Artic White grained Wood Affect.. Condition is New. Only selling because made to measure and ordered wrong size.